SAHS is an APPLE DISTINGUISHED SCHOOL!! 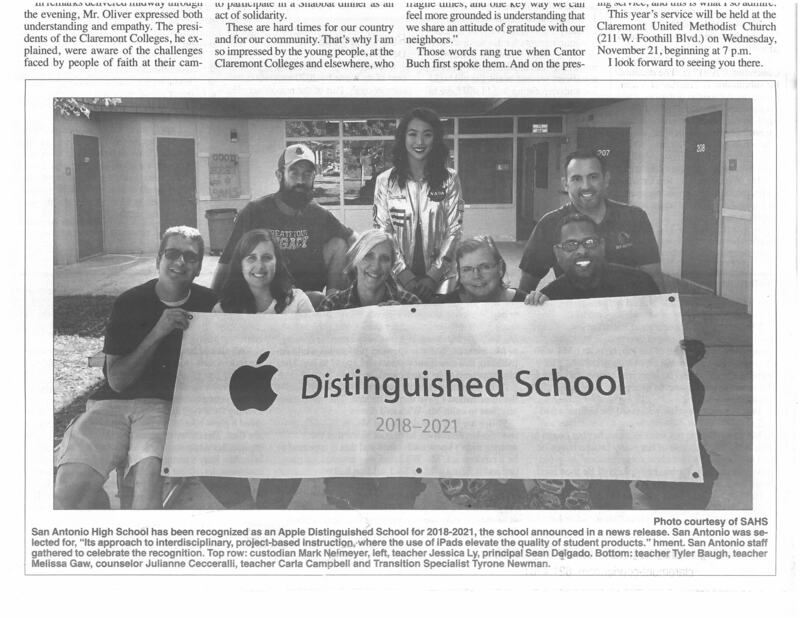 Claremont, CA -- October, 2018 -- San Antonio High School is pleased to announce that it has been recognized as an Apple Distinguished School for 2018-2021 for its approach to interdisciplinary, project-based instruction, where the use of iPads elevate the quality of student products. “This recognition validates the ingenuity that happens in our classrooms on a daily basis, and we are thrilled that our community can now see what we see and what Apple sees: an innovative school providing amazing learning experiences to the most deserving of students,” said Sean Delgado, San Antonio principal. The selection of San Antonio High school as an Apple Distinguished School highlights the school’s success as an innovative and compelling learning environment that engages students and provides tangible evidence of academic accomplishment. The projects at San Antonio cross multiple disciplines, and often involve high levels of collaboration, presentation, and critical thinking. In the “Science of Games” unit, for example, students create instructional books that share how to win at carnival games by increasing accuracy. This particular unit involves studying literature within Ender’s Game, applying scientific concepts like Newton’s laws of motion, and identifying mathematical principles of reflections, translations, and rotations of objects across a plane to create a multi-touch book that illustrates their learning. Students enhance their work using iPad apps like Vernier Video Physics and Book Creator to publish their findings. There are many other apps that allow students to write songs, make video, collaborate on editing papers, and engage in online discussions. The use of technology allows the teachers to completely reimagine the possibilities of traditional assignments. San Antonio High School is a continuation high school located in Claremont, CA. It serves approximately 80 to 100 students who are considered at-risk of not graduating high school. In addition to offering an innovative learning experience, San Antonio offers college-approved A-G coursework, extra-curricular activities such as Associated Student Body and Athletics, vocational courses through the Baldy View Regional Occupational Program, and a dual enrollment program with Citrus College. San Antonio is also a 3-time California Model Continuation School.